Even though you wrote and edited your manuscript, did you know that once you submit it to a journal for publication and the journal accepts your paper, the journal owns the copyright? One exception to this rule is when you publish a manuscript via Open Access. So what does this mean for you if you want to reuse your work? To understand your rights, you need to make sure you read the copyright transfer agreement (CTA) when submitting a paper to a journal. The CTA will spell out your copyrights and the do’s and don’ts of reusing your work. Reading the copyright transfer agreement (CTA) when submitting your paper to a journal is an important first step in understanding what you can do with your article once it’s published. The CTA will spell out who owns the copyright along with do’s and don’ts of reusing your work. For example, if you publish a manuscript in a Wolters Kluwer journal and you want to reuse portions of your article for non-commercial activities (such as reusing the information in a presentation at a conference), you can. You can re-use portions of your article (e.g., 1 image, 1 figure, 1 abstract, 1 excerpt) in an academic or scholarly newsletter if the newsletter is not produced or accessed more than 100 times, or if you want to make 100 photocopies (or less) of a portion of the article. Re-use of the full text of your article is acceptable when it’s translated and republished in other journals; used in a presentation at a conference or seminar (you can make up to 100 copies); posted on an institutional repository or personal blog (CTAs usually ask for an embargo period of 12 months); or used in a dissertation/thesis with no modifications. There are circumstances where you will need to obtain permissions from Wolters Kluwer to reuse your work. If the reuse of your work will be for commercial or for-profit purposes—even educational material sponsored by pharmaceutical companies—it will be subject to permission fees. 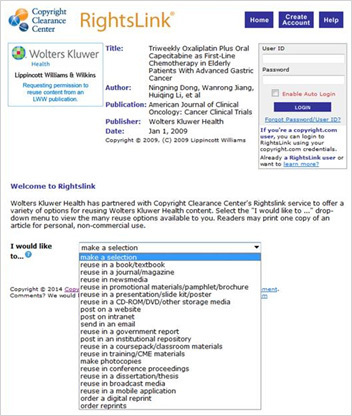 To request permission to reuse an article that you’ve had published in a Wolters Kluwer journal, you’ll need to visit RightsLink. All you have to do is go to the journal’s website or Ovid.com, locate your article using the Search function, and click on “Request Permissions,” which is located under the article title or on the right of the page under Article Tools. Once you click on “Request Permissions,” a form will come up where you can make your request for permissions. If you require any assistance with completing the form you can contact either the Copyright Clearance Center (CCC) at customercare@copyright.com or the permissions team at Wolters Kluwer at lwwjournalpermissions@wolterskluwer.com. How does copyright affect your ability to share your article on social media? Wolters Kluwer encourages authors to use social media to announce publication of their articles. You can post, tweet, or share the title of your article and include a hyperlink to the article abstract on the journal homepage, which is always freely available to all readers. Please note, however, that the CTA does not allow posting of the full-text article on social site networks, such as Researchgate. What about copyright when an article is published in an Open Access journal? 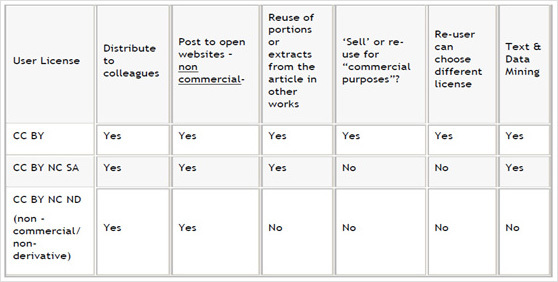 See the chart below for what you can and can’t do when requesting to reuse an article that was published in an open access journal. Always inquire about which license is provided for the journal (listed under User License in the chart below), and understand if there are article processing fees. For instance, the User License CC-BY-NC-ND provides authors with most protection, as it doesn’t allow anyone to modify your article without your permission. If a journal or book publisher has published your work and is a member of STM, which is a global trade association for academic and scholarly publishers, you may be able to reuse small portions of text and some images or figures in your new article. The association publishes a set of Guidelines where publishers agree as a group to permit specific text and images/figures between the publishers. To see if a publisher is part of the STM Guidelines, visit http://www.stm-assoc.org/copyright-legal-affairs/permissions/permissions-guidelines. Knowing your rights when it comes to copyright is important when you would like to share a part or all of a published paper, but it can be a bit confusing. For a list of frequently asked questions about copyright and permissions, visit http://www.lww.com/Home/opencms?id=JournalPermission.